I know that sounds harsh, but I must say that I’m very, very disappointed in John Fricke’s latest coffee table compilation book. I suppose my expectations were too high. I was expecting an exhaustive, comprehensive filmography. Considering how much time Fricke spends in various online discussion forums correcting, clarifying and ensuring he “sets the record straight” regarding who really did what in Judy’s films, there’s precious little of that here. He set his own high standard, then failed to meet it. Visually, the book is stunning. For their work, the designers should get every graphics award there is. The color scheme, the layout and the overall look is a visual delight. The photos, many new-to-print, are stunningly displayed on the highest quality paper. Plus it’s hardbound covered by an equally delightful dust jacket. All of this serves to make the book seem much more than it really is. The film shorts section is also incomplete, but as it’s titled “Selected Shorts” this isn’t surprising. And therein lies the book’s biggest fault: Space that could have been used for complete data is wasted. For example, it makes no sense to follow the opening biography with radio, concert and TV “sub-sections” instead of beginning Garland’s actual filmography. This breaks the flow and theme of the book. 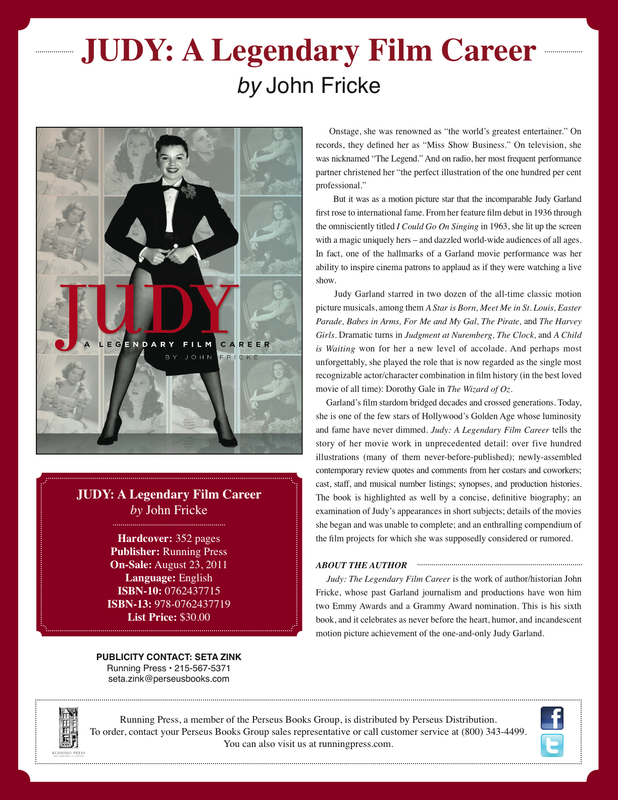 The book is titled a “legendary FILM career” not “a legendary SHOW BIZ career.” Discussion about the other aspects of Garland’s career should have been covered in the introductory biography. The result is that these sub-sections are too brief to be interesting, yet long enough to get in the way. The impression is that there was no clear vision for the book other than to compile photos, quotes (again), and reviews (again) only this time with a film theme. You can almost hear someone in the background saying: “We should throw something in there about her other work, I have pictures!” The casual reader might want more information about Garland’s non-film achievements, but with the lack of a bibliography they’re on their own. Perhaps Fricke assumes that readers will simply Google for more information. The absence of a bibliography, or even footnotes, renders the book useless for any serious study of Garland’s film career. This fact makes it just another pretty picture book compiled by a fan. Fricke is known for being savant-like with his impressive knowledge of Garland factoids, but even he can’t remember every word verbatim off the top of his head, unless he has hyperthymesia. The question is: Where does this information come from? Without a bibliography, Fricke’s declarative assumptions on events he didn’t witness (i.e. “…were instantly, gleefully added”) come off as just that: declarative assumptions. Fricke also rewrites history. He claims that the well known quote from director Charles Walters about Summer Stock: “How dare this look like a happy picture!” was said in jest whereas previous accounts have relayed the quote as being said by Walters in anger out of his frustration over the film’s difficult shoot. Which is true? Another example, also from the Summer Stock entry, is Fricke’s implication that Garland opted out of the hillbilly number in favor of performing “Get Happy.” The reality is that filming on Summer Stock was completed before “Get Happy” was even thought of. This is well documented, including Fricke’s 1992 overview of Garland’s career (highly recommended, and still his best book to date). This gloss job comes off as an attempt to bolster Garland’s well known natural show biz instincts. Her genius doesn’t need this help. Again, without a bibliography or footnotes it’s impossible to know where this information comes from, aside from the author’s view of Garland through rose colored glasses. There ARE some nuggets of information, the book isn’t ALL empty calories. You just have to look hard, as those nuggets could be in one of the biographical sections or a filmography entry. It takes some digging. In radio interviews prior to the book’s release, Fricke noted with salacious glee his newfound ability to “set the record straight” about the true actions and motives of people in Garland’s life who had passed away since his last two books, and there is some of that – but not enough to get that excited about. In the end, I shouldn’t be disappointed. A coffee table book is, by definition, a compilation of large photos and large text meant to attract the casual browser. Almost epistolary. In other words: Big on imagery, small on content. 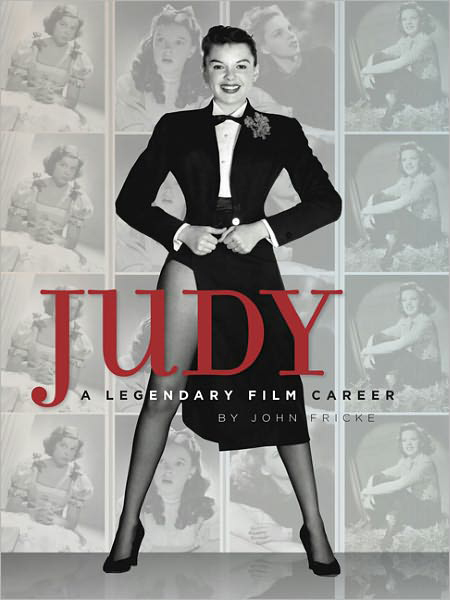 After all of the hoopla and high expectations, a great opportunity to finally present a definitive, comprehensive, and exhaustive (as the author might say) serious study of Judy Garland’s film career has been sadly missed. Prior to this book’s release, a prolific and well known contributor to the Garland discussion forums noted about another author’s project: “[He] keeps coming up with new ways to put out product utilizing the legacy of Ms. Garland.” That statement is apropos here as well. I hear the distinct sound of Fricke scraping of the bottom of his Judy Garland barrel. Still, the book IS pretty. If you’re looking for details about Garland’s films that offer more than a passing glance, this is not the book for you. If you’re looking for a pretty picture book, this is it.